A Spirited Dinner at Ralph's on the Park in New Orleans, Louisiana paired Corporate Executive Chef Haley Gabel Bittermann with Guest Bar Chefs Debra C. Argen and Edward F. Nesta for a special cocktail and culinary evening. 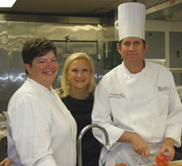 Every year, as part of the Tales of the Cocktail, participating New Orleans restaurants pair their Chefs with celebrity Guest Bar Chefs to create a spirited dinner where each of the chef's courses are paired with a cocktail created by the Guest Bar Chefs. While wine pairing dinners are the norm, cocktail pairing dinners are considered by many as a bit avant garde, so the Spirited Dinners held during the Tales of the Cocktail are thought of as really something special. The chefs and the guest bar chefs work together to let their imaginations soar to create a menu where the food and the cocktails work in tandem as a delicious team. 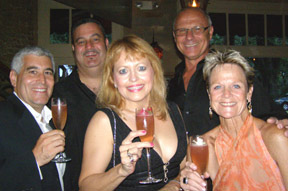 The Spirited Dinner at Ralph's on the Park was held on July 17, 2008 and was an undertaking of love. 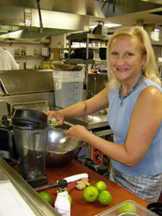 For Edward and me, it provided us with the opportunity to work hands-on in the kitchen a few days before the Spirited Dinner with talented Corporate Executive Chef Haley Gabel Bittermann, Executive Sous Chef Chip Flanagan, and the excellent culinary team, as well as work with Bar Chefs Laurie and Mike, the affable and experienced team behind the bar. Ralph's on the Park is located directly across the street from City Park where Spanish moss romantically drips from the trees conjuring up the quintessential image of the South. Inside the restaurant, diners have views of the park from the wide expanse of windows in the dining room, as well as in the bar. 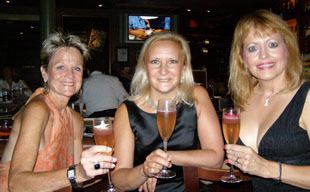 Since the Spirited Dinner was a special event, the dinner was held in the bar so that we could have a private room. Brass alligator sconces with amber hued globes adorned the walls hung with a large mirror and gold-framed photographs and newspaper clippings, a black baby grand piano was placed in the corner of the room, and wrought carriage lanterns hung from the bleached wood beamed ceiling that illuminated the room creating a soft ambience reflected on the highly polished wood floor. The tables were set with white linens and white napkins, sparkling crystal, and accessorized with tea lights and VIP Goody Bags from Luxury Experience Magazine and Fee Brothers. Ladder-back wood bar stools lined the well stocked bar where Bar Chefs Laurie and Mike graciously served Southern charm and hospitality as they made each of the cocktails according to our recipes. We began the spirited evening by welcoming our guests, a mix of local regulars as well as guests who had traveled to New Orleans to attend the Tales of the Cocktail, and toasting Ralph's on the Park and the 6th annual Tales of the Cocktail with a cocktail that we had created called the "Dona Flor," a luscious libation made with Moët and Chandon Champagne, rose jelly, hibiscus flower juice, lime juice, Sagatiba Pura Cachaça, and Grand Marnier, and garnished with a mélange of edible flowers, as a touch of the bubbly is always the perfect way to start an evening off on the right celebratory note. Nothing sums up summertime in New Orleans better than Creole tomatoes, and the first course was a lovely Creole Tomato Salad, with baby arugula, Vidalia onions, shaved Parmesan cheese, house baked French bread, and touched with basil vinaigrette. Months in advance of the dinner, we received the menu from Chef Haley Gabel Bittermann, and after looking at the ingredients in the recipe for the salad, we decided to incorporate some of those same elements in the cocktail, which evolved into "Marie's Garden," our take on a Bloody Mary using Hine Cognac, tomato juice, homemade pesto, lime juice, Fee Brother's Whiskey Barrel Aged Bitters 2008, and hot sauce. The second course was Soft Shell Crab Soup served with crab and corn hush puppies, which we paired with a cocktail we created called the "Clambake," which is a blend of Rhum Clement Première Canne Premium Rum, clam juice, corn kernels, lime juice, and simple syrup. I know that perhaps it sounds a bit strange, and I did get a few strange looks from Laurie and Mike when I described how to make this cocktail, however, the result is a tasty cocktail that picks up the flavors of the thick, rich bisque. Taking a moment to refresh between courses, our waiter Neil served the guests our lovely palate cleanser of "Ginger and Lime Sorbet," which Edward and I created in the restaurant's kitchen a few days prior to the dinner, made with lime zest, sugar, Domaine de Canton French Ginger Liqueur, and Fee Brothers Peach Bitters, and garnished with candied ginger, lime zest, and a teaspoon of Domaine de Canton French Ginger Liqueur. For the third course, there was a gorgeous Fennel Crusted Yellowfin Tuna grilled over an open flame, served on a bed of kalamata olives, haricots verts, chanterelle mushrooms, red onions, and fingerling potatoes. To complement this stunning course, we created the "Fenneltini," a cocktail with fennel infused Pearl Coconut Vodka and Extra Dry Vermouth, and garnished with attractive fennel fronds. The Spirited Dinner ended on an elegantly sweet note with a true taste of the South, with a Chocolate Pecan Pie made with Louisiana pecans with Felchlin dark chocolate over a white chocolate sauce, which we paired with the "Toast of the Town" cocktail made with Mount Gay Rum Eclipse, Domaine de Canton French Ginger Liqueur, Half & Half, and Fee Brother's Caramel Cordial Syrup that featured a chocolate and toasted crushed pecan rim. After dinner, we poured glasses of Hine Rare Cognac to sip and share with our new friends, and savor the spirited evening. Laissez les bon temps roulez! 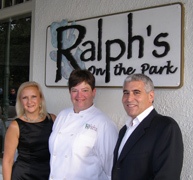 Ralph's on the Park is open for Dinner Sunday - Thursday from 6:00 pm - 9:00 pm, and on Friday and Saturday from 5:30 pm - 9:30 pm. The restaurant is also open for lunch on Friday from 11:30 am - 2:00 pm, and for Sunday Brunch from 11:00 am - 2:00 pm. Read Chefs' Recipes for an interview with Corporate Executive Chef Haley Gabel Bittermann and recipes for a delicious three-course menu including the recipe for the Chocolate Bourbon Pecan Pie from the Ralph Brennan's New Orleans Seafood Cookbook with Gene Bourg, Liquor Cabinet, where we share the cocktail recipes from the Spirited Dinner, and Luxury Products - Gifts section. 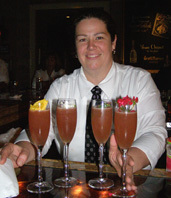 Read other articles on the Tales of the Cocktail and New Orleans in the Destinations, Hotels and Resorts, Restaurants, Chefs' Recipes, Liquor Cabinet, Awards, and Luxury Products: Gifts sections. 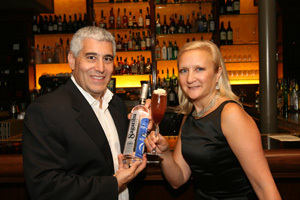 For information on the Tales of the Cocktail, please visit the website: www.TalesoftheCocktail.com. 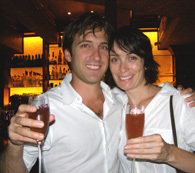 For information on New Orleans, please visit the website: www.NewOrleansCVB.com. © October 2008. Luxury Experience. www.LuxuryExperience.com All rights reserved.